COORDIAL is a real time application for the management of molten steel within the steel works of the Sollac Group (USINOR). Driven by the company MRP system, it pilotes the workshop Supervisor system. In use around the clock since 2 years at Dunkerque (F) and since 18 months at Fos (F), these applications optimise the major metallurgic operations in the entire steel works. The production of finished and semi-finished steel products is a very capital-intensive industry, at work around the clock, where a difference of a few degrees Centigrade or a few minutes delay can have important consequences in the overall cost. This is where the COORDIAL solution, built by ATOS, plays a very important role in keeping productivity high and costs low. There is a big gap between the daily orders (X tons of a given steel grade) and the various shop-level instructions that the supervisor can manage. Based on additional procedures, behavior models, machine characteristics, etc. the coordination process must generate precise instructions (down to the minute, and removing all generalities) to the shop floor. This process must of course, follow the events and allow for possible delays. On top of this, the temperature of the steel stock and time play a very important role in the process. Too cold, the batch has to be reheated, incurring energy costs and time. Too hot, the machines may be damaged. Too early, the machines are not available, or too late, the product continuity is disrupted...which is catastrophic in the process industry. What differs steel production from ordinary shops is the scheduling behaviour. Tasks duration depend on proceeding and succeeding tasks. COORDIAL is the solution developed by the Engineering Integration Division of ATOS for SOLLAC. Largely based on CHIP, it is very simple to use. The typical time horizon for scheduling is 24 hours, with a precision of 1 minute. It can also make simulations over 3 days horizon. Able to keep track of activities as and when they occur: the planning is continuously updapted by events from shop floor. This allows the operator to make up-to-date and timely decisions. COORDIAL takes orders (steel grade and quantity) from the MRP and provides optimal plans to be implemented at the shop floor level. The plans maintained by COORDIAL are automatically updated regularly by events received from the shop floor supervisory system (VIGILE from ATOS). 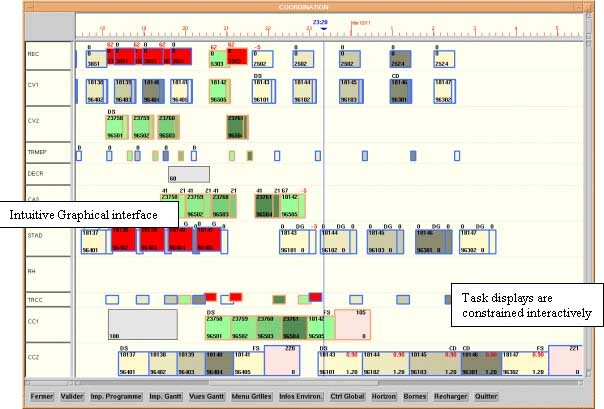 The operator may directly make changes via the interactive Gantt component. The updated plans are displayed via the Shop Floor Supervisor and detailed orders are put into action. Some 70 to 90 batches are handled daily at each site, where each batch involves 250-300 tons of steel. COORDIAL enables important energy savings, by ensuring that the batches arrive on time at the work stations. Even if productivity is increased by a few percent, COORDIAL gives substantial overall annual savings. Created by the merging of Sligos and Axime, Atos Group has a revenue of 7 billion francs and a total of 10000 employees (in 1999). Some 4500 employees work in Engineering Integration.